On 100th birth anniversary of ophthalmologist Dr Govinda Venkataswamy, google pays tribute with a special doodle. Dr. Govindappa Venkataswamy was born on 1st October, 1918 in Tamil Nadu's Vadamalapuram. 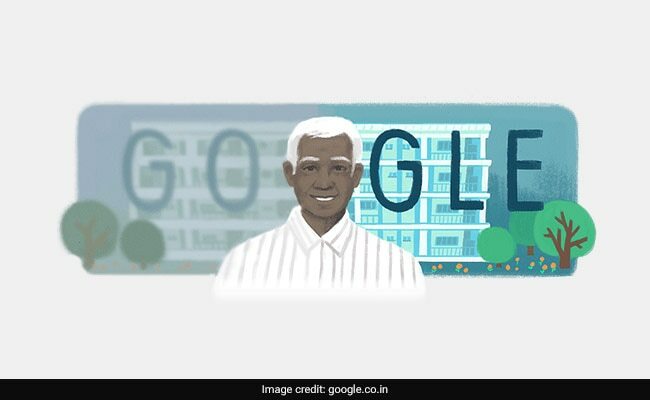 Google doodle on 100th birth anniversary pays a tribute to Dr Govinda Venkataswamy, an ophthalmologist with a doodle. Dr. Govindappa Venkataswamy was born on 1st October, 1918 in Tamil Nadu's Vadamalapuram. Dr.Govindappa Venkataswamy was known to his friends and patients as Dr. V. He was the founder of the renowned Aravind Eye Hospital. The hospital started as a small entity with only eleven beds. The hospital has changed the way eye ailments treated in the country. At an early age of thirty, Dr. Govindappa Venkataswamy was permanently crippled by rheumatoid arthritis. However, despite his own health issues, nothing could stop him from what he wanted to achieve. Rheumatoid arthritis is a chronic inflammatory disorder that can affect more than just your joints. In some people, the condition can also damage a wide variety of body systems, including the skin, eyes, heart, blood vessels and lungs. An autoimmune disorder this type of arthritis also occurs when your immune system mistakenly attacks your own body's tissues. Unlike the wear-and-tear damage of osteoarthritis, rheumatoid arthritis affects the lining of your joints, causing a painful swelling that can eventually result in bone erosion and even joint deformity. The inflammation associated with rheumatoid arthritis can damage the other parts of the body as well. While new types of medications have improved treatment options dramatically, severe rheumatoid arthritis can cause physical disabilities also. In 1973, Dr. Govindappa Venkataswamy was even conferred the Padmashree award for his outstanding service to the nation. Dr. Govindappa Venkataswamy had set up the Aravind Eye Hospital in late 1970s. The post by Google also notes that the hospital was financed by doctors mortgaging their homes and donating own furniture. It adds, "Today Aravind Eye Hospital has nearly 4,000 beds performing over 200,000 eye surgeries each year, with 70% of patients paying little or nothing." Despite the shared spaces, Aravind has managed to keep its infection rates low, an average of about four cases per 10,000 patients, compared to an average 6 per 10,000 in the U.K. Through its network of five eye care hospitals located in Tamil Nadu and Pondicherry, Aravind contributes to 42% of the cataract surgeries performed in the State of Tamil Nadu and 5% of all the national surgeries. This makes Aravind the largest provider of eye care in the world, both in terms of service delivery as well as training. Aravind maintains a surplus primarily through the earned revenue. The organization plans to sustain its growth and double its service delivery capacity by 2022 by expanding to new locations, expanding the medicine technology based primary eye care model for universal coverage, and expanding follow up of patients with chronic eye diseases. Aravind now performs more than 1,000 procedures each day across all its hospitals.